Old Soldiers’ Home’s Randolph Gate Closed in 1953 | Park View, D.C.
Monday, when I posted about the Park Road entrance into the Old Soldiers’ Home being closed in 1955, a reader wanted to know about the Randolph Street gate into the property. Well, now I have an answer to that. According to a December 5, 1953, article in the Washington Post, the Randolph Street and Park Road gates were scheduled to close to traffic that used to drive through the Old Soldiers’ Home on December 9, 1953. 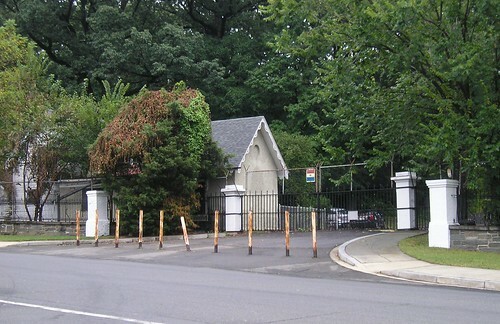 Since the 1955 article addresses the Park Road gate again, that gate may have been open in some way after the 1953 closing. I find it interesting that both gate articles state the cause of the closures being due to the construction of the Washington Hospital Center, and a desire for the Soldiers’ Home to not have traffic sitting on its property because of the construction. I also find it interesting that the article suggests drivers use Park Place to the west of the Soldiers’ Home since their commutes through the property was ending. This seems to be the start of a problem we are still dealing with today as drivers speed down Rock Creek Church Road to get to Park Place, and then speed south once they get there. The entire 1953 article is after the jump. This entry was posted on September 9, 2009 at 7:01 am and is filed under traffic. You can subscribe via RSS 2.0 feed to this post's comments.